Superior Mesenteric Artery is a major artery of the abdomen. 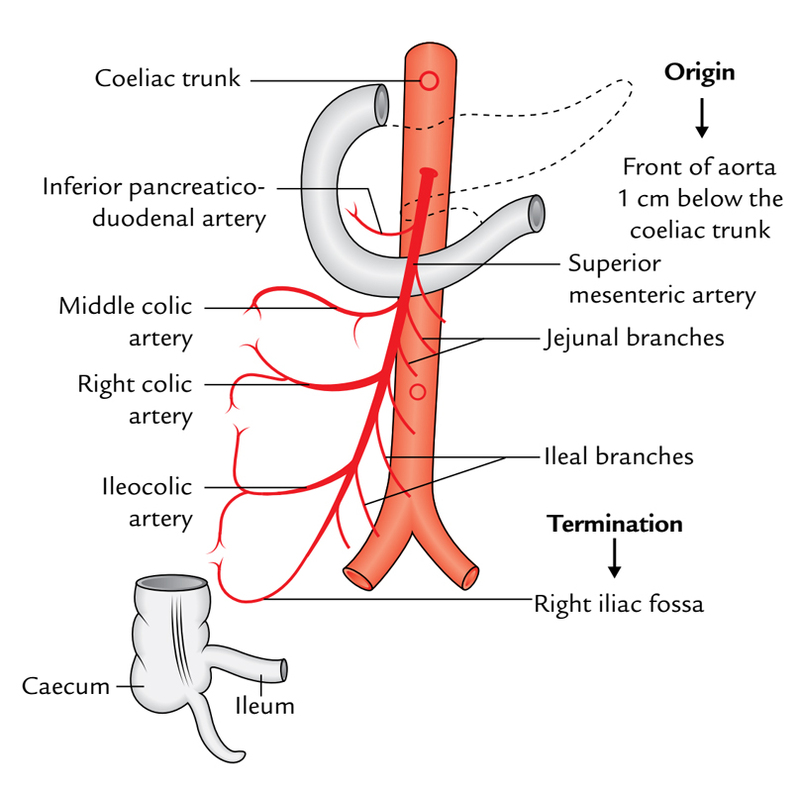 It appears from the very front of the abdominal aorta supporting the body of pancreas near its neck in the level of L1 vertebra about half inch (1.25 cm) below the origin of coeliac trunk. From its origin, it runs downward and to the right passing first in front of the uncinate process of the pancreas, and after that in front of the 3rd part of the duodenum to goes into the root of mesentery where it runs between its 2 layers. It ends in the right iliac fossa by anastomosing with a branch of ileocolic artery– 1 of its own branches. Throughout its course, the superior mesenteric artery is escorted by the superior mesenteric vein on its right side. Anteriorly from above downward it’s related to the body of pancreas and splenic vein. Posteriorly from above downward it’s related to the left renal vein, uncinate process of the pancreas, third part of the duodenum, IVC, right ureter, and right psoas major. 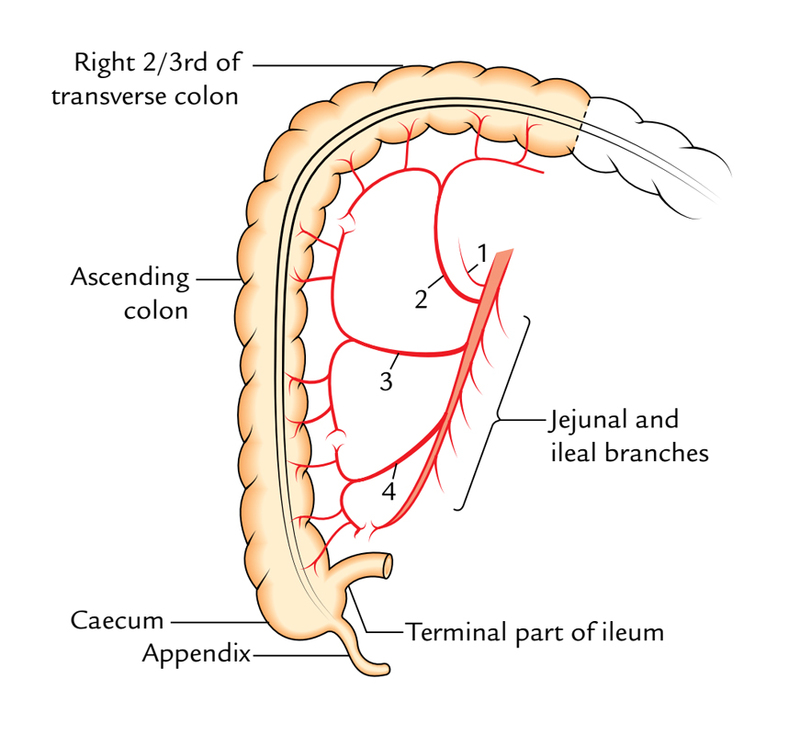 All the branches originate from its right side with the exception of jejunal and ileal branches which originate from its left side. It appears from the right side in the upper border of the horizontal part of the duodenum and shortly breaks up into anterior and posterior branches which run in the pancreaticoduodenal groove and end by anastomosing with the anterior and posterior branches of the superior pancreaticoduodenal artery. Inferior pancreaticoduodenal artery is the initial branch of superior mesenteric artery. It appears from the right side, just below the pancreas, and runs upward and forwards to pass between the 2 layers of transverse mesocolon, where it splits into left and right branches. 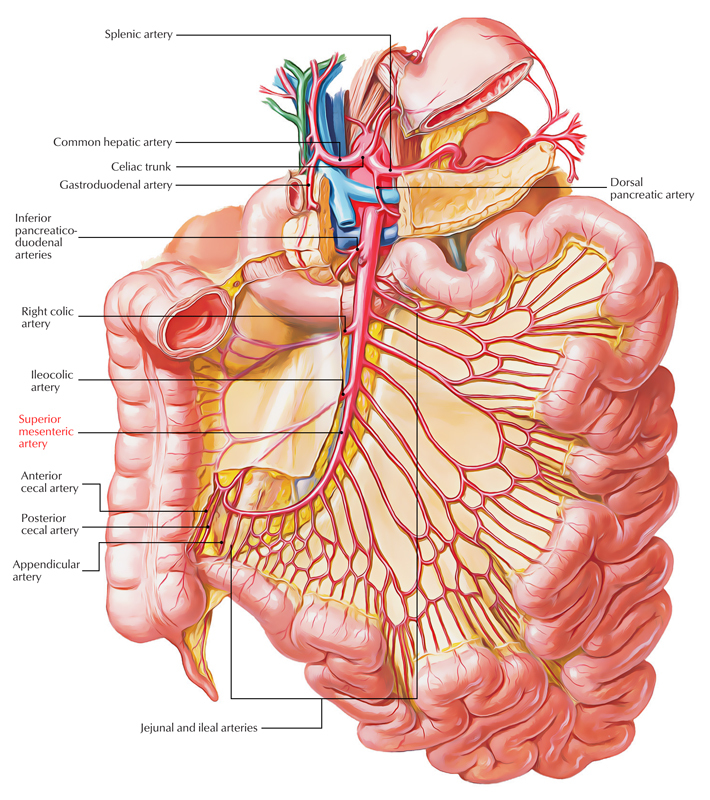 The right branch anastomoses with the ascending branch of the right colic artery and the left branch anastomoses with the ascending branch of the left colic artery, a branch of the inferior mesenteric artery. It originates from the right side near the middle of the superior mesenteric artery, runs to the right supporting the peritoneum and breaks up into ascending and descending branches. The ascending branch anastomoses with the right branch of the middle colic artery and the descending branch anastomoses with the ascending branch of the ileocolic artery to create the start of the marginal artery of Drummond. Anterior and posterior caecal arteries to the caecum. Appendicular artery to the appendix. Ileal branch to the terminal part of the ileum. These branches, about 12-15 in number originate from the convex left side of the superior mesenteric artery. They pass between the 2 layers of the mesentery of small intestine. They branch and anastomose with every other to create a series of arterial arcades from which additional branches originate and create the 2nd, third, and even fifth grades of arterial arcades. The number of these arcades rises from the jejunum to ileum. Eventually the straight branches referred to as vasa recta originate from these arcades which pass on each side of the small intestine to supply it. The vasa recta are longer and not as numerous in the jejunum than in the ileum. All of the small intestine suitable (i.e., jejunum and ileum) is supplied by the jejunal and ileal branches of the superior mesenteric artery with the exception of the terminal part of the ileum that is supplied by the ileocolic branch of the superior mesenteric artery. The superior mesenteric artery is the artery of the midgut, thus it supplies all the derivatives of the midgut, viz., lower half of the duodenum (below the opening of hepatopancreatic duct), jejunum and ileum, caecum and appendix, ascending colon and right 2-third of the transverse colon, and lower half of the head of pancreas.